The base red (orange?) color has been painted on the jeep's outer body, only two more coats of red will be applied on the base color after mechanical and electrical work. 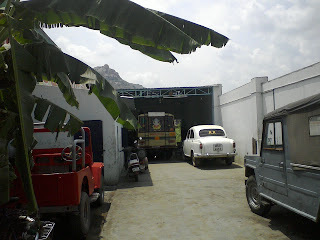 To move the jeep from Body workshop to Mechanic's garage some of the basic mechanical work has been completed. 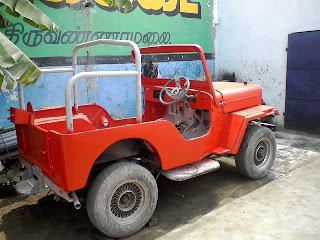 as another milestone in the restoration work that is today the jeep has seen its re-entry into the mechanical workshop. As a parallel work, last week I bought two color Italian leather fabric for the lining work. The liner is making a special seat cover for the jeep. 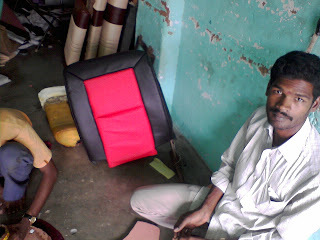 Here in the below picture see the liner making the red and black themed seat for the Mahindra Classic. Hey.. Glad to see the progress. A shining black Classic might be my choice. Have never seen a red classic though. must look better than black i think. Waiting to see it in roads near velachery . good luck for hassle less completion of your project.